I know, real leather doesn't get this sort of damage. But sometimes, what you have is the faux leather. And once it's damaged, they look awful. What to do about it? Faux leather is a plastic-like surface over a fabric structure. When some of the plastic surface gets scraped off (usually on the toe or the heel of the shoe), the fabric under part is revealed, and makes it so obvious that the shoes are a cheap, faux leather. 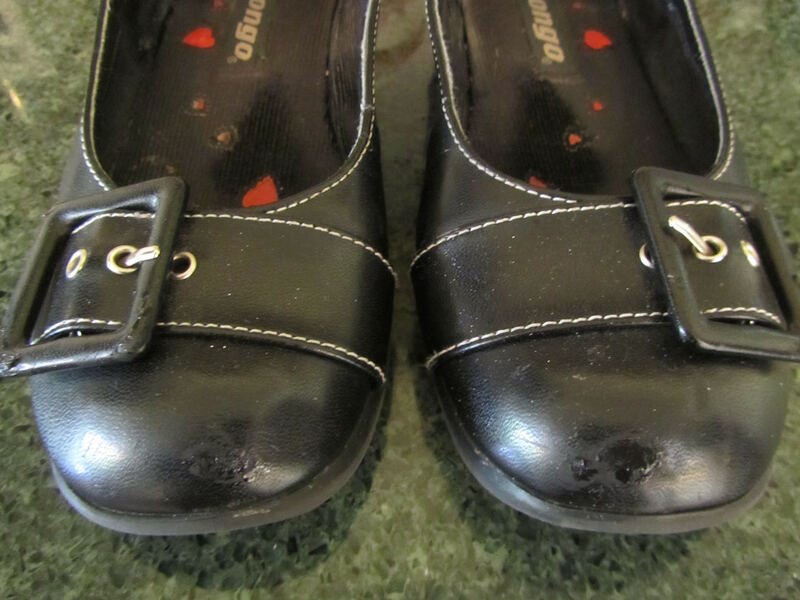 We've repaired this kind of damage to several pairs of shoes, over the years, using craft acrylic paint and clear fingernail polish. About a year and a half ago, one daughter repaired her brown prairie boots. We didn't have a shade of brown which matched her shoes, so she took several browns that we had and mixed a suitable match. Her repair lasted about a year, and she recently retouched the surface of her boots. 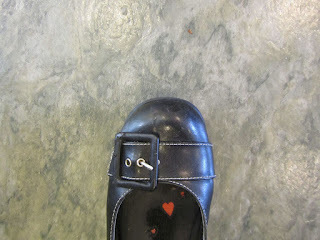 About a week ago, my other daughter was lamenting needing to buy new black shoes. I told her to hold off, and we'd see about fixing her current ones. 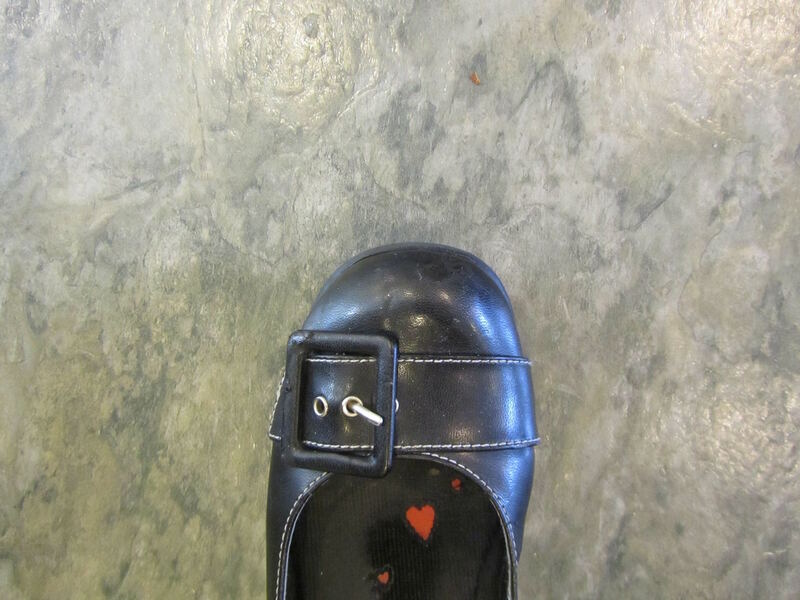 One day when she was sick, I decided to do something nice for her while she napped, and I fixed her shoes. They were pretty scratched on the toes and the edge of the buckle. I used black craft acrylic paint (the kind you pay under a dollar for at Michael's or Jo Ann's), and a paint brush and dabbed paint onto the revealed fabric, under the plastic faux leather surface, on the toes as well as the buckle. I allowed the acrylic to dry thoroughly, and then a coat of clear nail polish over the paint. That's it. 5 minutes of hands-on time. Here are the shoes, close up, with the fix. And here's what it looks like from a normal, eye to shoe distance. Before, you could definitely see that the shoe was scratched and damaged. Now, you can't tell unless you are up close. My daughter has a hard time finding shoe that fit her foot comfortably. So, we're always reluctant to have to replace a comfortable pair. 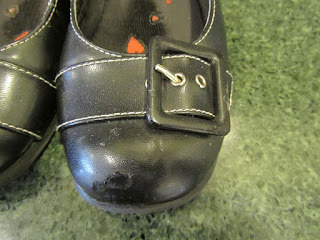 Making these shoes last another year, at no cost (we had the supplies at home), is all Win. Any time you can make a pair of shoes last longer, is a win in my book. I have done something similar, but didn't finish up with the nail polish. I'll have to try that next time. The nail polish gave the repair a waterproof coating, important, in our area, when tromping through soggy grass! Awesome tip! Great that you were able to extend the life of those shoes. I know, and usually the shoes we fix like this have at least another year of life in them. I've got to do my other daughter's black flats, next. Thanks for the tip. So many accessories are made with faux leather these days. The worst is when an item says "genuine leather" and it falls apart like cardboard, which happened to my husband. Can't remember where we bought his belt, but the problem is not faux but fraud. I recently bought "925" stamped jewelry from the wish app, and was pleasantly surprised with the appearance, but am very skeptical about it being 92.5 percent silver. I had to see what it looked like since the price was too cheap, $1 plus $1 shipping, and now I'm wondering how I can avoid being scammed in the future when fake stamped jewelry and other products like fake leather are flooding the markets. Sorry for the rant. I don't mind faux as long as I know that it is just that. I recently did the "eye can't catch that" business when I repaired some old termite damage on our black stained wood beam (ceiling). After patching the damage with stainable wood dough, I ran a black Sharpie over the patched area. Can't really tell looking up from the ground. I saved buying a can of black stain, which probably could not do the job as well as a Sharpie, since I'd have to apply numerous coats just to get the right shade of black. oh my goodness, on that belt! I would be upset, too! Good job on the wood beam repair! Wow, I'm impressed! Great repair work and for so little time and effort. Kudos to you once again Lili! Thanks, Jayne! It really is an easy "fix". Lili, this is genius! I have a favorite pair of flats that I will this on. On a completely different subject, we're visiting ou son in Seattle this week. Any hints on any frugal sites to see or hear. We love music, art, and history. The natural sites would be of utmost interests. We are of advanced age so scaling Mt. Rainer is out. Is there advice on enjoying it close up? I know Mt Rainier is the "big" mountain here, but the most interesting mountain, from a recent history perspective, is Mt. St. Helens, the volcano that erupted in 1980, and sent an ash cloud from one end of the state to the other. "Explore the Frye Art Museum's rotating selection of its large collection of 19th and 20th century German, French, and American paintings and sculptures, including a collection of paintings by Munich-based artists acquired by Charles Frye in the late 19th century. Admission is always free, as is parking, and complimentary tours are available Tuesday through Sunday at 1 p.m. and Saturday, Sunday, and Tuesday at 11:30 a.m."
"The Seattle Art Museum's waterfront Olympic Sculpture Park is a nine-acre (3.6-hectare) industrial-site-turned-green space. Dotted with contemporary works of art by artists such as Richard Serra, Alexander Calder, and Mark di Suvero, the park is set against a spectacular backdrop of Puget Sound and the Cascade Range with a 2,200-foot (671-meter) pedestrian path that leads to a beach. Open daily, free of charge." the largest city park in Seattle is Volunteer Park, on Capitol Hill (just east of downtown). in the park is the water tower. There's an observation deck in the tower, if you can climb stairs. This is "poorman's space needle" for the view of Seattle. "With a prime Capitol Hill locale, climbing the popular water tower at Volunteer Park offers the "best free panoramic view in Seattle," as voted by readers of Seattle Weekly." "Explore Washington Park Arboretum's 230 acres (93 hectares) of 10,000 native plants in this internationally recognized woody plant collection, featuring sorbus, maple, hollies, oaks, conifers, and camellias. Free tours are available every Sunday at 1 p.m. (January-November)." "Discover the natural splendor of the Pacific Rim at the Burke Museum of Natural History and Culture, free first Thursdays and with extended hours (10 a.m. to 8 p.m.). The museum is considered the Northwest's premier repository of cultural and natural history artifacts, with highlights like a resident spider expert (to curate its collection of 150,000 arachnids) and Northwest Coast totem poles at the entrance." Those are free (or low-cost) sites I'd recommend. The Metro bus is great for daytime travel throughout the city. And you don't have to seek out parking. Have a fun time, Bonnie! Thank you for posting this, Lili! I hope you don't mind, but, I just opened a file in my docs and did a cut and paste of these tips. I hope to visit Seattle one day, perhaps in combination with an Alaska Cruise. If I can ever save enough money to get there and do one or both of my dreams these tips will be so helpful! I, too, hope you can visit Seattle, one day. It's a beautiful city. I have a few other favorite places in the city. I'll do a post someday with more info. I have genuine leather shoes that have scuff marks on the toes. How do I "shine" those up? They were very expensive due to having to buy good shoes for my plantar fascitis and I don't want to mess this up. Would a black shoe polish ruin the shoes? They are a Mary Jane type and they are I think a German shoe. I always need to buy a shoe that the insert can come out so I can put in my orthotic. Most shoes have the insert glued in and ripping them out is so difficult. I really wish we could get away from all the cheap shoes. I even have purchased Clark shoes because they have this cork-like cushion that is wonderful on my heel but the stitching almost always comes off very quickly. with genuine leather, do you use shoe polish? 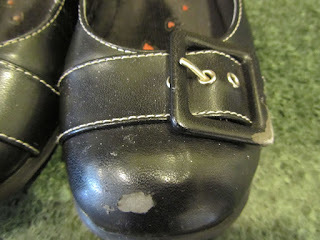 Those small tins of wax polish are what we use on real leather shoes, (Kiwi is one familiar brand). They're a couple of dollars a tin and last for a couple of years of polishing. You smear the wax on, let dry, then buff to a shine. They do an amazing job at making a worn pair of shoes look fresh again. My son polishes his work shoes about once a month, and he's kept those shoes looking good for 5 years. The soles are more worn out that the uppers, now. Just match the color of the leather stain. SO terrific, Lili. A great example of repairing something to make it last longer. Thanks, Belinda! I happy for my daughter to not need to buy another pair of shoes for a little while. Great idea! I have used the Sharpie fix on my kid's black shoes for years, but never followed up with nail polish--and I was always stumped about fixing white shoes. Paint would work! I did this on a pair of faux leather white sneakers for one of my kids, years ago, with white acrylic paint. The shoes were hand-me-downs, so for the price of the tube of paint, we had decent pair of sneakers, with minimal effort. Good job, Lili. I'm one too, who has been known to fix many things with Sharpies and acrylic paint, clothing and otherwise. I enjoy the challenge of repairing damaged things to a usable state again, for both environmental and economical reasons. I especially like adding life to something that I know will just end up in a landfill, as the condition looks so off-putting, as is. Aren't Sharpies the best invention? I've touched up so many "surfaces" with a Sharpie, and practically everyone has one in their house, so a quick touch-up is a no-brainer fix. Yes, Sharpies are the best!!! I have Faux leather boots too. I wore them in dodgeball(stupid idea). I scraped them up badly. I went to Walmart and bought Shoe Shiner. I rubbed it on the boots and got them slightly wet. Once I was done they looked almost new!